Lauren Fleishman was born and raised in Brooklyn. She won scholarships to the School of Visual Arts in New York and the Ecole Superieure des Beaux-Arts in Paris. In 2003, she was named one of Photo District News‘ 30 young photographers to watch, and was included in American Photography for four consecutive years. Her Time photo essay Sixteen Candles and a Time multimedia piece about photography as an aid to amnesia, were cited by the PDN Annual. Her work on love and aging has been exhibited at the Brooklyn Public Library, and she is currently seeking funding through Kickstarter for Love Ever After, a project about couples married 50+ years. Her clients include Time, Newsweek, Esquire, The Fader and The New York Times Magazine. LF: There are many photographers who continue to inspire me, but the first was Nan Goldin. I remember being introduced to her photographs as an undergraduate student at The School of Visual Arts. I had studied photography in high school, but the curriculum was fairly conservative and her work wasn’t covered. LF: Goldin’s work gave me a different understanding of photography because she made it accessible. She made it a possibility because she demonstrated that a great picture could be of your friend in her bed or at a bar or in the back of a taxi. I didn’t have to travel to some far off place or use heavy equipment to take a great photograph. But it was really the intimacy in her work that attracted me the most because I was always curious about the way that other people live. I remember seeing a Nan Goldin shoot published in The New York Times Magazine in 1996 of sixteen year old model James King. I’ll never forget Goldin’s picture of her, backstage at a Karl Lagerfeld show, on the floor with perfect hair and a cigarette. It was just this idea of being able to see backstage that excited me so much. It was a model, but she wasn’t posed. It was a real moment, and that’s exactly the type of work I wanted to make. From Goldin’s pictures I learned a very important lesson. I learned that I needed to make photographs that were personal to me. 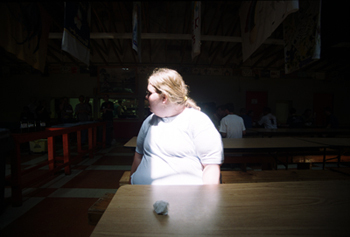 During my last years of college I would begin a project that would document a weight loss camp I once attended. I did this as a way to understand what had been one of the most difficult times in my life. About six years after I saw Goldin’s work, my own pictures would be published in The New York Times Magazine and it would start my career. LF: Photography can be a very difficult profession so you really need to work on projects that are meaningful to you. If you do this, no one else will be able to see it or document it in the exact same way. I also try to approach everything with an open mind. I’ve shot hundreds of assignments on so many different subjects and I always allow myself to be surprised. You need to be curious in order to stay interested. In 2008, Magnum photographer Abbas was asked the same question and I loved his answer: “Get a good pair of walking shoes and fall in love.” Being a romantic myself, I especially like the part about falling in love! Born in 1953, Nan Goldin spent much of her early life in Boston. In 1965, her older sister Barbara Holly committed suicide, an event which affected her deeply. At the alternative Satya Community School, she met friends who introduced her to the city’s gay and transsexual subculture which she began to chronicle with her camera. After graduating from The School of the Museum of Fine Arts, she moved to New York and began photographing the New Wave music scene, and friends in the city’s drug and gay subcultures. These searing, intimate images of her “tribe” evolved into a ground-breaking multimedia piece called The Ballad of Sexual Dependency. She also documented her own dependency on alcohol and drugs, and the toll that AIDS took on her circle of friends. in 2006, Goldin was admitted to the French Legion of Honor, and in 2007 was given the Hasselblad Foundation International Award. Her work has been exhibited at major museums around the world, including the Museum of Modern Art, the Whitney, the Centre Pompidou, and the Louvre which commissioned Scopophilia (“the love of looking”) and gave her permission to photograph throughout the museum. She is represented by the Matthew Marks Gallery in New York.